A pristine reef in the Maldives. Introduction I recall several years ago preparing my reef tank (and its caretaker) for a trip I was going on. I was to be gone three weeks. Luckily my caretaker was himself an excellent reefkeeper and my system was relatively easy to maintain. All was well and I wasn’t particularly worried about leaving. When I returned the tank looked more-or-less alright, but many of the corals appeared noticeably bleached. That’s not good, I thought to myself. The next day I asked my caretaker what had happened. As it turned out, I had left the new light timer that I installed just before my trip switched into the ‘on’ position instead of in the ‘timer’ position. It took a bit more than a week to realize and correct the problem, meaning my corals were exposed to relatively bright light for more than a week straight. Evidently this is not the best thing for them. Within a few weeks most had returned to a normal, pre-bleaching appearance. While this event wasn’t a “good” thing to have happened to my tank (defining “good” as results I like, namely happy, healthy, growing corals), it wasn’t that bad either. No, to get into the territory of “bad” took a power outage I had a few years later, while I was away for the weekend. This time I returned to an aquarium that was about 60 °F and had had no circulation for at least a day. The fish and a handful of corals (amazingly) survived. The shrimp and most of the corals did not. One of the hallmarks of a great reefkeeper is learning how to evade Murphy’s Law (whatever can go wrong will go wrong) and thereby avoid or correct the little problems that can quickly snowball into catastrophes. Coral reefs in nature aren’t likely to be harmed by a 24/7 photoperiod, a power outage, a three-year-old dumping a can of Spaghetti-O’s onto them, or many of the other pitfalls that our aquaria are susceptible to. They do experience disturbances though. Some disturbances are relatively mild and many reefs easily recover from them, while other reefs do not recover after the same sort of disturbance. Other disturbances can be quite severe yet certain reefs eventually recover while others are pushed into a downward spiral eventually culminating in outright collapse. Why such differences? Why does one reef recover from a severe disturbance while another is pushed over the edge by something comparatively minor? In this article I’ll discuss some of the most important types of disturbances that occur on real coral reefs. Our ultimate goal will be to understand the factors that help to determine why some reefs recover rapidly from disturbance and others do not. In short, we will work toward understanding reef resilience. Acute vs. Chronic Disturbance Important to our discussion is the distinction of acute vs. chronic disturbance. Acute disturbances are those that occur abruptly and are relatively short in duration. For instance, a hurricane can cause acute disturbance to a reef. The direct impacts of the storm usually don’t last more than a few hours to days, though indirect impacts can be a bit longer lived. Chronic disturbances are those that are relatively long in duration. For instance, situating a sewage outflow next to a coral reef and pumping a town’s sewage out near the reef for decades would constitute a chronic disturbance. Acute disturbances can also constitute a chronic disturbance if they occur at high frequency. For instance, a single mass coral bleaching event would constitute an acute disturbance. Mass bleaching events occurring every year to every few years would reasonably be considered a chronic disturbance. 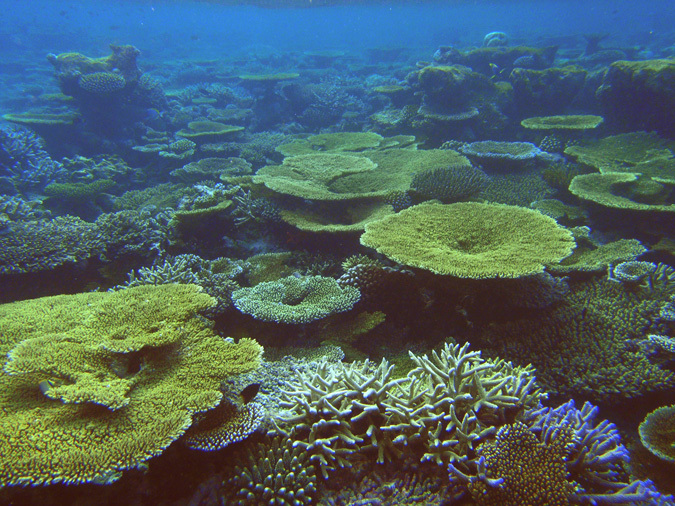 Storm damage can be devastating, but reefs usually recover nicely. Hurricanes and Typhoons Grab a few powerheads, plug them in, and toss them into your reef tank, letting them blow sand where they may. Now take a baseball bat, tennis racket, hockey stick, or related object, sink it into the tank and just start swinging. To replicate a fringing or near-shore reef go ahead and dump in some freshwater—enough to drop the salinity by 5, 10, 15 ppt let’s say. To top it all off, feel free to add a bit of runoff collected from a local storm drain—the higher the concentration of petroleum, fertilizer, and pesticides/herbicides the better! Don’t forget to add a generous dollop of mud to the water column. Congratulations, you’ve just done a reasonable job of recreating the disturbances associated with a hurricane/typhoon in your aquarium. And just in case you were wondering, no, you should not actually do any of these things. Early signs of corals under stress. To really replicate a hurricane in our aquaria, though, we’d need to up the water change regime. The equivalent of a 100% exchange would need be performed anywhere from every few hours to every few weeks, depending on the reef we mean to replicate (very frequent for exposed reefs subject to strong currents, very infrequent for enclosed lagoons or bays). 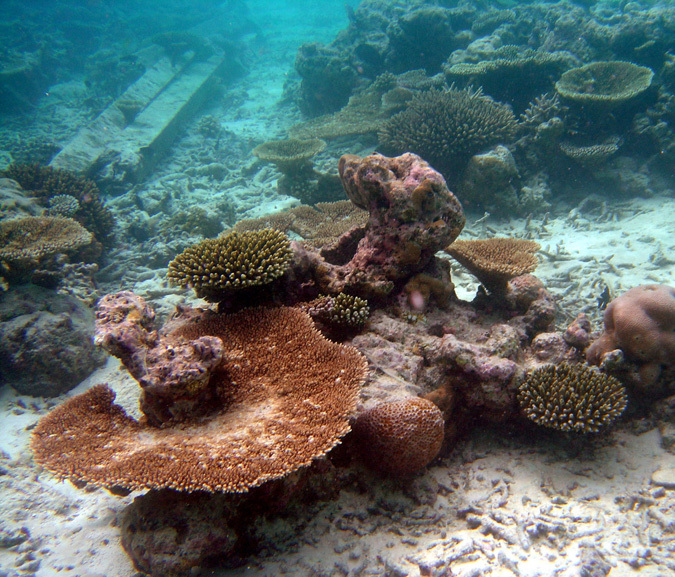 Hurricanes and typhoons cause several types of damage to coral reefs. Firstly, they cause physical damage to the corals that create the habitat. It might seem nearly impossible to break off large coral colonies from the reef—those that have attachments as thick as ones waist, sometimes even thicker—but a strong storm can do so, and then toss them about as though they were proverbial ragdolls. 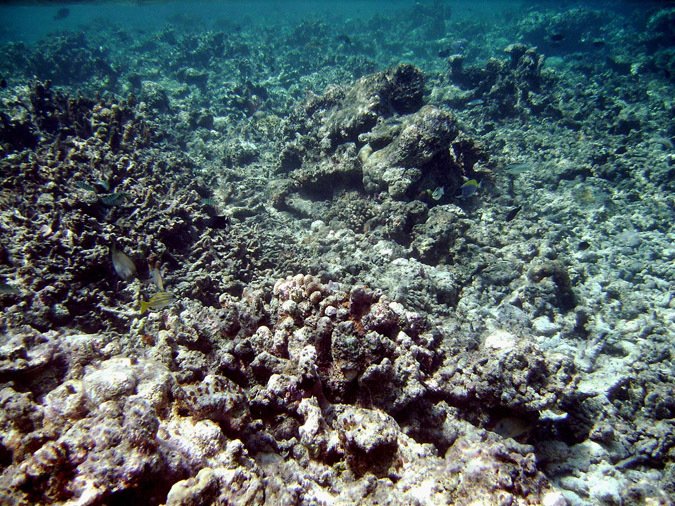 After a big storm a reef will have many unattached and broken pieces of coral haphazardly strewn about. Thankfully, as reef aquarists well know, these pieces can reattach to the substrate and continue growing if they happen to fall into a place where they are physically immobilized. Gluing down coral frags takes advantage of this natural capacity for vegetative growth. Many of the fragments won’t be so lucky and simply end up dying as they are tossed around on the seafloor, but those that do successfully reattach can encourage rapid recovery of the ecosystem. In addition to the physical damage that hurricanes and typhoons cause they may stress corals and other organisms by temporarily reducing salinity and water quality and increasing sedimentation. Reefs that occur near shorelines are likely to be the worst affected by these sorts of stressors, since all three are usually associated with runoff from land. The historical influence of flood plumes in northern Queensland can be detected on the inner Great Barrier Reef tens of kilometers offshore, hence “near” is a relative term. Local dynamics are key in determining how severe these stressors are. These stressors can and certainly do kill corals and other organisms, but they typically dissipate within a few weeks. 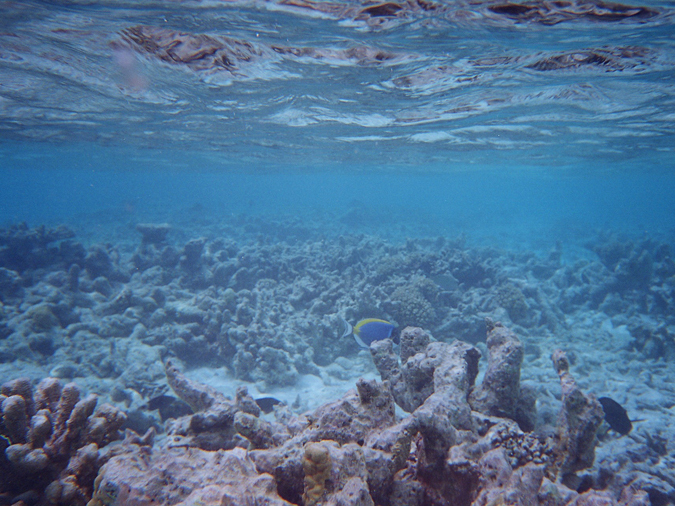 Hurricanes and typhoons may cause quite a bit of damage to a coral reef when they hit, but since they are usually infrequent events at any given location (rarely are reefs hit more than every 3-4 yrs, on average, and usually much less often) reefs are often able to recover from hurricane damage, and often times quickly, if other conditions are conducive to recovery. A storm by itself rarely if ever causes ecosystem collapse on coral reefs. Of course, nowadays hurricanes are rarely the only stressor a coral reef might be dealing with. Reef destruction can be either acute or chronic-neither is a pretty sight. COTS Outbreaks COTS is an acronym standing for Crown-of-Thorns Starfish (Acanthasterplanci)—those devilishly beautiful echinoderms, present where coral reefs occur throughout the Pacific and Indian Oceans and the Red Sea. They rely solely on live coral as a food source as adults. COTS have been present on these reefs and eating corals for a very long time, as evidenced by finding their spines in cores of reef sediments extending well into the past. 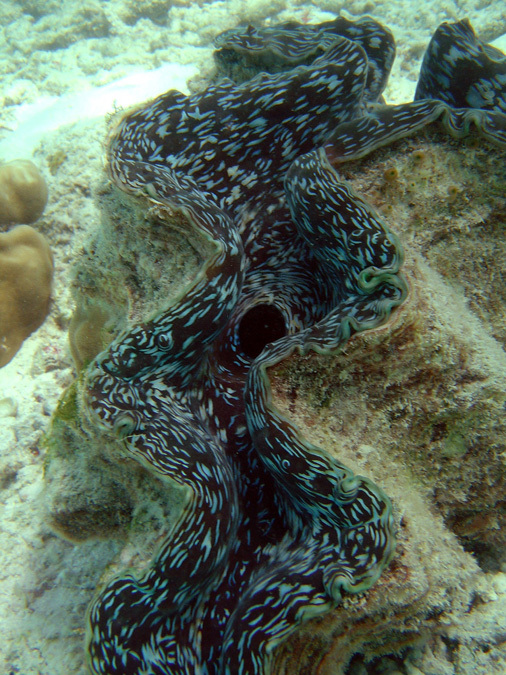 Most of the time they are relatively rare on these reefs and cause almost unnoticeable damage to the live coral cover. On occasion over at least the last 50 years they have experienced local population explosions—outbreaks, if you will. In places ranging from Guam to the Great Barrier reef this starfish has, in the order of a few months, gone from being something one could hardly find and had to search for on the reef to densities of several adults per square meter. During these outbreaks their nearly unnoticeable nibbling of coral colonies becomes a bit more aggressive—as much as 90% of the live coral has been eaten on some reefs during one of these outbreaks. That is, up to 90% of the coral, most of which took the better part of a decade to grow (with some very old, very large colonies being hundreds of years old), has been eaten within a few months. 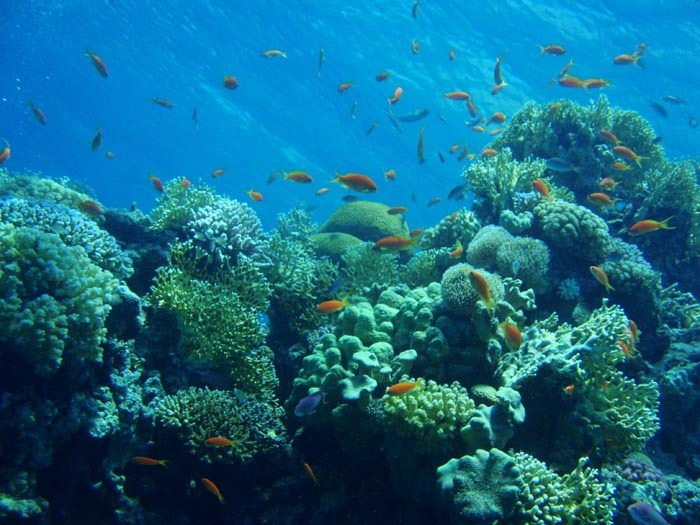 Outbreaks have also been relatively frequent on some reefs—frequent enough that the coral population is not able to fully recover between outbreaks. While the presence of COTS on these reefs is nothing new, the extent and frequency of outbreaks does appear unusual compared to the historic and prehistoric condition. Two recent phenomena appear to be encouraging such outbreaks. First, nutrient enrichment of coastal oceans as a result of human activities, including changes in land use practices and the use of chemical fertilizers, seems to encourage higher rates of survivorship and settlement of COTS larvae. With more nutrients there is more plankton, more food for larval COTS, more of them survive the larval period and settle on the reef and wham, bam, all of a sudden there are lots and lots of adult COTS munching on corals. The second phenomenon that appears to be encouraging outbreaks is overharvesting of the natural predators of COTS, such as the Giant Triton (Charonia tritonis) and Humphead or Napoleon wrasse (Cheilinus undulatus). It is quite certain that populations of COTS would fluctuate naturally. Increased larval survival and settlement (due to nutrient enrichment related to human activities) along with decreased rates of predation on post-settlement and adult COTS (due to overfishing key predators) seem to have allowed natural fluctuation to develop into outbreaks, as have been observed over the last few decades. 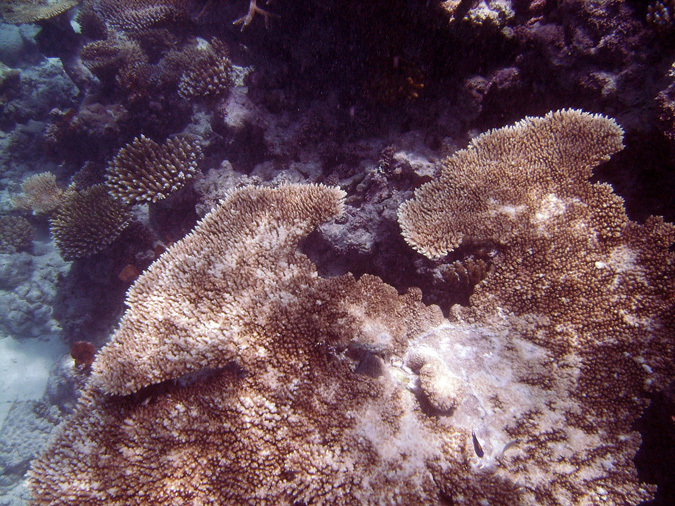 Bleaching is perhaps the best known form of coral stress. Climate Change Far and away the single largest disturbance to coral reefs in recent times has been the effects of high temperature stress, as related to climate change. In the last century the Earth’s climate warmed by about 0.7 °C (1.3 °F) with most of that warming occurring in the last 30 yrs. The climate has warmed, and continues to warm, as a result of human activities, principally the release of greenhouse gases (such as CO2) to the environment. This warming trend also comes in opposition to a natural slow cooling trend that had been occurring for the last several thousand years. Overlain on the warming trend have been numerous El Niños and La Niñas which, along with large volcanic eruptions, tend to dominate inter-annual climatic variability. With a strong La Niña, such as the one we experienced last year, we end up with cooler conditions globally than we would experience based on other conditions. With an El Niño, such as the weak El Niño we are currently experiencing, temperatures end up a bit warmer globally than we would experience otherwise. That is, we see the cool side of the prevailing climate with a La Niña and the warm side with an El Niño. High temperature stress is one of a variety of stressors that can cause coral bleaching. When corals bleach they lose a large portion (up to 90%) of their symbiotic algae and/or the photosynthetic pigments of those algae. Bleaching as a phenomenon has been known of for decades, but typically only in individual corals or in very local areas. In the early 1980’s a new phenomenon began to take shape, that of mass coral bleaching. During such an event not one or a few corals bleach, but almost all of the corals on a reef bleach all at once. Bleaching results in profound physiological stress to the coral. While it is sometimes possible to recover from bleaching, if conditions are good, many bleached corals simply die. Recovery is often a slow process as well. Some corals have shown measurable reductions in reproductive output for as long as three years after having “recovered” from bleaching (that is, regaining a normal density of zooxanthellae). Others have failed to return to normal growth rates even 10 yrs post-bleaching. The mass bleaching events of the 1980’s and 1990’s tended to be associated with El Niño events, that is, the warm end of the natural range of climate variation for the prevailing climate conditions. El Nino events earlier this century did not cause mass bleaching like those of the 1980’s and beyond largely because the temperatures attained during these earlier El Niños were generally cooler than the latter ones, owing to the cooler climate of the time. The year 1998 ushered in the largest El Niño event of the last century. Coupled with nearly 0.7 °C of warming, 1998 ranks in the top two hottest years on the instrumental record and was far and away the hottest year recorded for the tropics. Sure enough, the largest mass bleaching event ever observed occurred in 1998. Reefs in every region of the world bleached and about 16% of the world’s tropical corals died as a result of bleaching. Mortality was less severe in some places, and far worse in others due principally to the severity of the temperature stress (in other words, bad luck). For instance, more than 90% of the corals died on some reefs in the Maldives. Over the last decade mass bleaching events have continued to coincide with El Niños, but are also starting to occur in non-El Niño years. Nowadays it is rare that a summer season goes by without large-scale bleaching occurring somewhere on the planet. On individual reefs mass bleaching is occurring with a frequency of about 5-10 yrs. As the climate continues to warm the frequency and severity of bleaching are expected to increase. On our current trajectory bleaching events are expected to occur on the order of every 2-3 yrs on an individual reef within 20-30 yrs and to become annual events on most reefs within about 50 yrs, assuming corals show little acclimation or adaptation to these rising temperatures. Therein lies some good news and some bad news. The good news is that at least a few mechanisms of acclimation to warmer temperatures (e.g., hosting more temperature tolerant zooxanthellae) are possible for some corals. Hence, we might hope that at least some corals remain healthy and continue to proliferate as the climate warms. The bad news is that many corals seem unable to acclimate fast enough to keep pace with the rate of climate change and therefore simply bleach and die. In addition, recent work suggests that the chemical changes CO2 induces in sea water (i.e., ocean acidification) exacerbate the effects of temperature stress on zooxanthellae. If these results prove to be generally true amongst corals then ocean acidification will be sensitizing them to elevated temperatures right at the time when we would most hope for them to acclimate to elevated temperatures, with unhappy results. Besides bleaching, elevated temperatures also reduce rates of larval survivorship, settlement, post-settlement survivorship and growth in a variety of corals. Elevated temperatures can reduce growth in adult corals and significantly increase susceptibility to disease. All of these effects work in conjunction to reduce the coral population on reefs. Ecological Resilience Imagine you are hacking your way through a thick jungle. The sheer density of the vegetation is incredible, but you manage to clear a path. Several weeks later you pass by the area again and see that the path you cleared, machete in hand, has been overgrown so quickly you can scarcely tell you cleared a path at all. Let us now contrast that with clearing a path through a lichen patch in the far north. Since the lichens come off the ground but a fraction of an inch simply walking over them is sufficient to make your way. By using the same path for a while the underlying lichens will be quickly scoured away. If we now avoid this path will we see the lichens growing back and overtaking out steps after a few weeks? No, we won’t. What about after a few months? No, not then either. What if we wait a few years? Even then, it’s not likely. Instead it may take on the order of decades for the damage to be repaired. After similar disturbances to these two ecosystems we find that they show vastly different rates of recovery, where we define recovery as return to conditions consistent with the steady-state that was present prior to the disturbance. In ecology the likelihood an ecosystem will recover after a disturbance is termed its resilience. An ecosystem that is highly resilient is one that is very likely to return to the original state after a disturbance and very unlikely to collapse into some alternative state. One that is not very resilient is one that is likely to fall into some alternative state. For instance, if a forest experiences succession after a forest fire and eventually returns to a similar forest ecosystem it is relatively resilient. If instead the forest gives way to grassland and remains as grassland then the forest was relatively less resilient. Reef Resilience Some of the pioneering studies on coral reefs and indeed the very work that helped to define what a coral reef is and how it functions were conducted in the 1950’s on the northern shore of Jamaica. The reefs were spectacular—some of the best in the Caribbean and rivaling any in the Indo-Pacific. Those reefs had been growing well there for thousands of years, since the rate of sea level rise dropped near zero after the last glaciation. During that time they were hit by countless hurricanes and myriad other disturbances, but they always recovered from them and continued growing. These reefs were highly resilient over the last several thousand years. In 1980 Jamaica was hit by hurricane Allen, a category 5 storm that caused major damage to the corals, especially the branching staghorn (Acropora cervicornis) and elkhorn (Acropora palmata) corals. Over the next three years some recovery began to occur though as some corals (especially Porites and Agaricia) colonized the bare substrate. In 1983, however, an epizootic spread amongst the long spinned urchinDiadema antillarum throughout the Caribbean, reducing their numbers by 95%+ throughout their range. Within a few months a variety of macroalgae took hold and covered all available substrate. The cover of live coral dropped to ~5% (down from 50% prior to Allen) while the cover of macroalgae increased from ~5% to near 90%. Many of these reefs remain in a similar state (low coral cover, high macroalgae cover) to this day while others have only recently shown significant signs of recovery. How did these reefs become so much less resilient to disturbance in just a few decades? The first step was overfishing. Some of the first species to be overfished in Jamaica, as ascertained through archaeological evidence, were not fish at all but rather sea turtles. Green sea turtles in particular were orders of magnitude more abundant in the Caribbean than they are today just a few hundred years ago. They formed a gigantic and effective algae grazing force on the reefs. 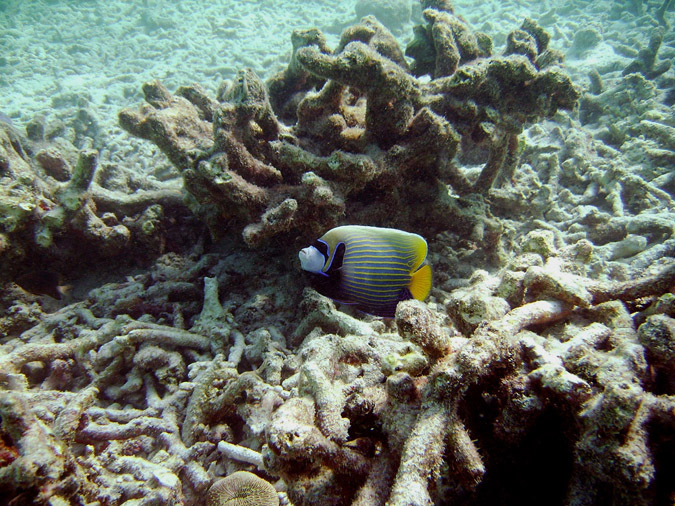 As they were hunted down some other grazers, namely surgeonfish, parrotfish, and Diadema urchins were able to take up the slack and keep algae grazed on the reefs. In the last century all sorts of fish, including surgeonfish and parrotfish, were more heavily targeted. By the 1960’s and 70’s especially fish biomass on Jamaican reefs was low, yet the reefs still appeared relatively healthy due to the coral cover and diversity. In 1983 the other shoe finally dropped: the Diadema, the only major grazers left, succumb to disease. Without sufficient grazing the coral reefs quickly transformed into algal reefs. Coastal pollution, increased sedimentation (due to poor land use practices), coral disease, and stress associated with climate change have worked to further hamper the possibility of recovery of these reefs. A few themes emerge from this example that have been demonstrated on other coral reefs (and in other ecosystems) as well. First, functional redundancy is often a key to resilience. If the Diadema had largely died off in 1983 but these reefs had not been severely overfished and Green sea turtles had not been nearly exterminated the outcome of the collapse of the Diadema might have been very different. Having said that, functional diversity is often a key to resilience as well. For instance, recent work on the Great Barrier Reef demonstrates that it simply isn’t enough just to have herbivores on a reef—the particular kind of herbivore matters. Surgeonfish and parrotfish are very effective at cropping short algal turfs and keeping the reef substrate “clean” and ready for settling corals and other invertebrates. They are generally very ineffective at dealing with large masses of macroalgae. Instead, a few select species of rabbitfish as well as batfish take up this role. By analogy: a lawnmower is great for keeping grass clipped back, but is useless for clearing brush. A brushhog can take care of the brush, but won’t do much to help with the lawn. In many ecosystems biodiversity is a critical component of ecological resilience. Another take-home message here is the importance effect chronic stressors can have on ecosystem recovery. Chronic overfishing, sedimentation, etc. worked to prevent recovery in this system, and on many other coral reefs. This is the death of a thousand cuts. As such, when a large disturbance does occur (e.g., a hurricane, bleaching event, etc.) the reef simply ratchets down to a more degraded state. With every disturbance more coral dies yet it is not replaced due to the pressure of chronic stressors. Conclusion A variety of disturbances, ranging from those associated with hurricanes, to COTS outbreaks, to climate change, put pressure on coral reefs. Coral reefs recover from disturbances when conditions are such that they confer resilience to the reef. Reefs collapse upon disturbance if conditions cause them to have little resilience. Substantial, diverse populations of grazers help to confer resilience. Diversity both in terms of species and genetic diversity within species helps to confer resilience. Minimizing or eliminating chronic stressors (especially chronic human stressors such as overfishing, sedimentation, nutrient enrichment, etc.) helps to confer resilience. Effective local management helps to keep reefs resilient, and gives them the best chances of recovering from natural as well as man-made disturbances.